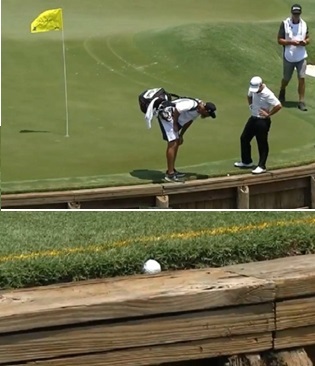 US Pro, Brian Harman, found his ball in a difficult lie on the iconic, island green 17th hole at TPC Sawgrass during the first round of the 2018 Players Championship (see photos). Harman’s options were limited. a) He could not take relief for an embedded ball because his ball was inside the margin of the water hazard, Rule 25-2. b) For the same reason he could not take relief from the wooden bulkhead, an immovable obstruction, Rule 24-1. c) Nor could he deem his ball unplayable in a water hazard, Rule 28. d) Note that the line defining the water hazard margin is yellow, which means that the option of dropping within two club-lengths of where the ball last crossed the margin, not nearer the hole, is also not available, Rule 26-1c. After carefully studying the situation, Harman decided that he did not want to risk playing the ball from such a precarious lie, prised the ball from the turf and waked back to the designated dropping zone for a penalty of one stroke. His other options, also for a penalty of one stroke, were to return to the teeing ground, or to drop a ball behind the water hazard, keeping the point at which the original ball last crossed the margin of the water hazard directly between the hole and the spot on which the ball is dropped, Rule 26-1b. Englishman Tyrrell Hatton, currently ranked as the 21st best golfer in the world, made an elementary and expensive mistake in a sudden death shootout, which prevented him from progressing to the weekend knockout stage of the 2018 WGC Dell Match Play. Hatton was preparing to tap-in for par at the first extra hole when he noticed his ball had moved slightly after he had placed his putter behind it. Instead of replacing the ball without penalty, as permitted by the Local Rule introduced in all Tour events and by most amateur Clubs, he assumed that he was penalised one stroke for causing his ball to move and then compounded his error by holing out from this wrong place, instead of replacing the ball. Unbelievable from a Tour Pro! The Local Rule, which all Clubs and Societies should have introduced from January 2017, is ‘Accidental Movement of Ball on Putting Green'. There is a full explanation in this blog of mine. It seems that many golfers imagined that the modernisation of the Rules of Golf would result in there being far fewer Rules and that they could be learned with little effort. One correspondent noted that although the current 34 Rules have been reduced to 24 Rules, there are almost as many sections, more sub-sections, more Definitions and more Exceptions. I haven’t counted these for myself, but I can tell you that there are 156 pages of Rules and Definitions in the proof copy of the new Rules, and only 104 pages of Rules and Definitions in the current Rules book. This should shatter the misconception that golfers can forget most of what they have learned about the Rules, obtain a free copy of the soon to be published ‘Players Edition’ * and will never get caught out by a Rule again, because that is not going to happen! One of the reasons why the new Rules book contains more pages than the current Rules book is that some of the rulings that have been interpreted in over 1,300 interpretations in the Decisions on the Rules of Golf book are now incorporated into the new Rules of Golf, others will not be relevant to the modernised Rules and the remainder are likely to be covered in yet another publication from the Ruling Bodies, 'The Official Guide to the Rules of Golf', a “guidebook” that replaces the need for a Decisions book and will contain information to best support committees and officials. Don’t misunderstand me, I certainly approve of the modernisation of the Rules of Golf, because for the majority of players there are going to be fewer principles for them to learn, there will be more resources to assist them, including the aforementioned 'Players Edition', and the pace of play should be improved for amateur golfers. Of course, there will still be a requirement for experts who can navigate their way through the new Rules book, and associated guidebook, to assist in making definitive rulings for the incidents that will inevitably arise (see the last item in this blog). * The Player’s Edition will include the Rules that describe the essential characteristics of the game of golf – for example, the fundamentals of the game, such as playing by the Rules, the different parts of the course and the equipment to be used. It also covers the most commonly used Rules. For the less frequently occurring situations that are not included, the Player’s Edition will tell the golfer where to find those answers in the full Rules of Golf. It is anticipated that a year or so after the new Rules of Golf become effective (January 1st 2019) there will be major changes to the way that golfers around the world will calculate their handicaps. The new World Handicapping System, to be implemented some time in 2020, follows an extensive review of systems administered by six existing handicapping authorities: Golf Australia, the Council of National Golf Unions (CONGU) in Great Britain and Ireland, the European Golf Association (EGA), the South African Golf Association (SAGA), the Argentine Golf Association (AAG) and the USGA. Free answers to your rules questions (usually within 24 hours). Free subscription to the Rules News which is published four times a year. Free loading of your USB key with all training materials from The Oswald Academy (slideshows, exercises etc.) – and free access to it all on Dropbox. A 15 % discount on all Oswald Academy courses, rules trips, seminars, books etc. for personal use. A free newsletter which gives you all the latest information about The Rules of Golf straight into your inbox. More benefits that we are still working on. There is also a Club membership (US $599 p.a. ), which should be a ‘must join’ to ease the burden for all Club secretaries / managers. For more information on either membership click on one of the following links (all that is required is your name, email, address and golf club), or you can email Brian direct at, bno@golfrules.com. Does a Local Rule Override a Rule of Golf?